From the Lincoln tide pools to the Bulls Bay waters, this eclipse is made for you and me. There is nothing in astronomy so moving as the moments of totality during a total solar eclipse. Total eclipses are rare phenomena to be sure, but they are regular events for the citizens of planet Earth, because from our frame of reference, the Sun and the Moon are close to the same size in the sky. The regular periods of these orbiting bodies cause the Moon to come between the Earth and the Sun on a regular basis. 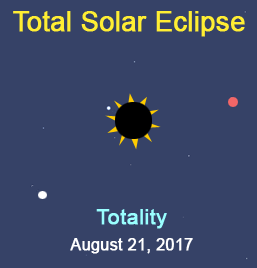 So what can an Earth observer in the U.S.A. who is located on the umbral path of totality actual see when the Sun is eclipsed by the Moon? During a total eclipse, only when the Moon is totally covering the Sun, is it safe to look up at that brilliant orb. Even 1 percent of the solar disk can damage a sensitive eye. As the disk of Moon and the Sun come together, one can see that last splash of light before it disappears. This is the diamond ring effect. Next Baily’s Beads, those last gasp slivers of light that penetrate between the Moon’s peaks and valleys on the edge or limb of the lunar disk can be seen briefly. The entire area is plunged into darkness, but a glance around to the horizons will reveal the light that is still streaming down wherever totality is not occurring. The Sun is a sphere of gas, so immense that it is slightly flattened, actually oblate. It is the heart and the master of the solar system and the Earth is just one of the planets that have orbited this celestial body its entire life. During totality, Earth-bound observers can see some features of this life-bringing body. Most notably, the Sun’s corona appears starkly in the sky surrounding the Moon and closest celestial bodies. It appears white and is indeed white-hot as the temperature of the corona varies from 1 to 3 million degrees according to where the Sun is in its cycle of high and low activity. Other features called prominences can be observed telescopically. These are massive flames appearing magenta in color that shoot out from behind the moon’s shadowed disk. A telescope is essential to viewing these features, but how short is the time of totality! Yes, here is the same Moon you have seen (observed, viewed, marveled at) your entire life. Luna always shows her same face to the Earth because it is tidally locked with our fair planet. The dark side of the moon is the side of the moon in shadow, where the Sun does not shine. The far side of the moon is always hidden from us. Its orbit traces out an ellipse. Sometimes the Moon is farthest away from Earth or at apogee, but when its orbit moves it closest to the Earth it is at perigee. Because the Moon and the Sun are at varying distances from the Earth, their apparent size is slightly different during every eclipse. The best eclipses, those with longer duration of totality, occur when the Moon is near perigee, closest to Earth. In the darkened sky during totality, nearby celestial bodies can suddenly make their presence known. 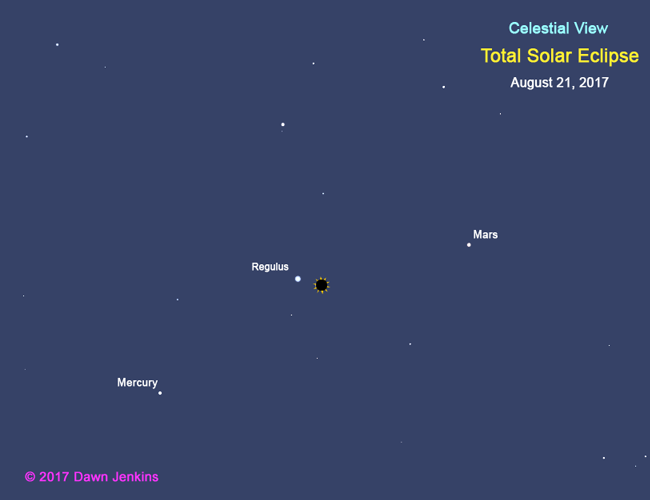 During totality on August 21, 2017, the closest object is the first-magnitude star Regulus. It is an incredible 1 degree away from the sun during the eclipse. This star is the alpha star of the constellation Leo. It is one of the few first magnitude stars that are located on the ecliptic, that imaginary path in the sky where the Sun, Moon, and other planets of the solar system (including Earth) reside. This is because all the large objects in the solar system really orbit the Sun’s equator. It is called the ecliptic because this is where all eclipses in the solar system occur. During totality, other stars in Leo should come out, as Regulus is the heart of the constellation, Leo often hosts eclipse events. This is what is meant when astronomers say the Sun is in Leo and why I believe that astronomical events like eclipses helped Earthlings to unlock many the secrets of the solar system and the universe. The stars of Leo’s mane create a popular asterism that looks like a backward question mark. You may or may not notice the stars during the brief moments of totality, but the charts presented here show the constellation clearly. My second favorite planet, Mars (Earth being #1, of course) will be found around the 2 o’clock position, 11 degrees away. Will it still show its red color, or will we be too excited to notice? Because it is so close to the Sun relative to Earth, we won’t see this planet again until the orbits carry it back into view for Earthly observers. Mercury will show up around the 6-7 o’clock position, a bit closer than Mars. For some observers, this will be the only time they will see the closest planet to the Sun. Mercury orbits the Sun faster than any other planet and so may be difficult to observe as it sets shortly after sunset and rises early before the Sun, always close to its parent body. It just can’t be seen when it’s high in the sky. Our sister planet, Venus is much further away during the eclipse, having reached greatest elongation or distance from the Sun in early June. From Earth reference, she is slowly making her way back toward the Sun. She is close to two bright stars in the constellation Gemini, Castor and Pollux. The distance between the Sun and Venus is 34 degrees on August 21; located between 2 and 3 on the clock dial. All too soon totality is over, again Baily's beads, another diamond ring. Quickly, turn your face and grab all the filters because the Sun’s radiation is bad for your eyes. The Sun will outshine all those stars and planets and all that will be left is bright daylight. The path of the shadow for this eclipse is only ~70 miles wide, it speeds across the US at 1,651 mph. It only takes it 90.7 minutes to make this trek, and the maximum duration of totality is 2 minutes and 40 seconds. Although the eclipse begins in the Pacific Ocean and disappears in the Atlantic, the only landfall that it makes is in the United States of America. It is truly an American total eclipse. Note: Measuring distances between objects in the sky can be done by holding out your fist and sighting along it. Your fist should cover about 10 degrees of the sky. During the eclipse, it should fit between the Sun and Mercury or some similar distance. 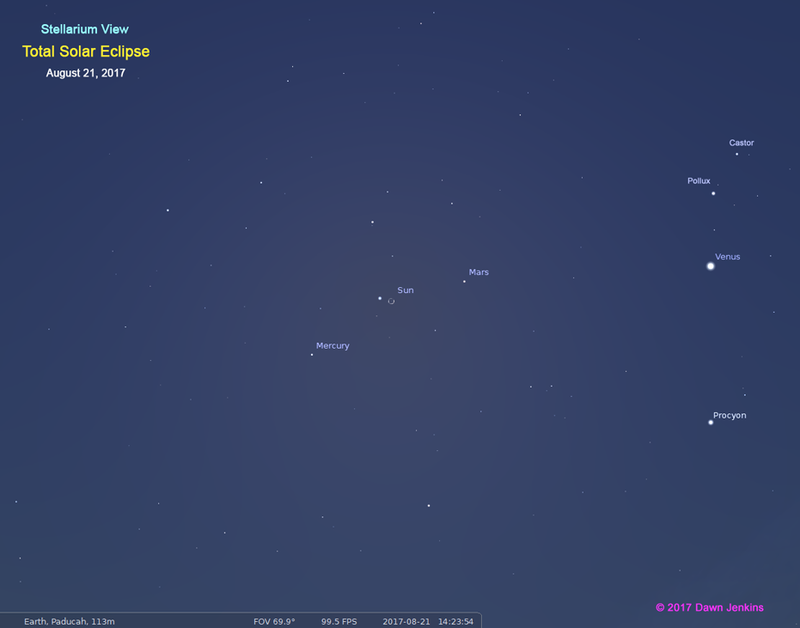 Notes on the Illustrations: These images were created by Dawn Jenkins, using the open source software, Stellarium, centering the eclipse from the location of Paducah, KY where the eclipse begins at 1:22 pm local time. The images have been modified for this presentation. Stars down to third magnitude have been included. The images have been modified for this presentation. The second image is basically a screen shot. Distances cited in this article were calculated by Stellarium’s built-in angle measurement tool plug-in. Notice of copyright: This article was written by Dawn Jenkins. Borrow if you must, but please just give me the credit I deserve. I have designed and written the article. You did not.